As much as I might be asked to hate Jack the Giant Slayer, I can't. 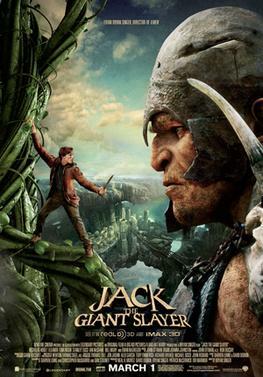 I didn't love it nor would I put it as a great film, but on the whole Jack the Giant Slayer is mildly entertaining, if nothing else. Jack the Giant Slayer stays pretty close to the fairy tale. We begin with little Jack and little Princess Isabelle being told how giants once swept through the land. Good King Eric the Great defeated them by taking the heart of one and making a magic crown that would make the giants subservient to his will. After he threw them up the beanstalk King Eric was buried with both the crown and the seeds that would bring about the beanstalks. Move ahead ten years. Our Boy Jack (Nicholas Hoult) goes into the village to sell the family horse and cart. Jack, a bit of a dreamer, gets sidetracked by a puppet show reenactment of the war with the giants of long ago. As it so happens, there is someone else in the audience, a beautiful girl who is harassed by some ruffians. In comes Elmont (Ewan McGregor) who comes to rescue the incognito Princess Isabelle (Eleanor Tomlinson). She yearns for great adventure and freedom, especially since she will be forced to marry Lord Roderick (Stanley Tucci), a man who is not only old enough to be her father, but who loves her power. Roderick has secretly taken the crown and beans from Eric's tomb, aided by his henchman Wicke (Ewen Bremner). A monk has taken the beans and handed them to an unwitting Jack in exchange for the horse (the cart having mysteriously been stolen while at the puppet show). Jack takes the beans and his uncle is highly disappointed. As it so happens, Isabelle has fled her father King Brahmwell (Ian McShane), and finds herself taking refuge in Jack's hut. While there is an instant attraction she can't marry someone not of royal blood. Fortunately, a major storm brings one of the beans to life, and up Isabelle goes to Gargantua. The King, desperate to get his daughter back, sends his best men led by Elmont up the beanstalk. Jack insists of going as well. Surprisingly, Lord Roderick supports Jack's cause, and up they go. They encounter the giants, who now want revenge for their exile. To the horror of Elmont, Isabelle, and Jack, Roderick turns traitor, wearing the crown in order to use them to conquer the kingdom. Then Jack turns hero: rescuing Elmont and Isabelle. As the heroes are descending, King Brahmwell opts to tear it down lest the giants use it to go down the beanstalk. When one watches Jack the Giant Slayer, if one does not take things too seriously, one can find enjoyment in the film. Darren Lemke, Dan Studney, and Christopher McQuarrie's screenplay (from a story by Lemke and David Dobkin) I don't think ever found a tone and stuck to it. Sometimes it seemed to play for laughs (Tucci in particular acted as if he were in almost a spoof, making his Roderick a more comedic villain). Sometimes it seemed to want to play things straight and serious (this was true of McGregor, one of my favorite actors, who played Elmont as a strong and serious warrior). Sometimes it shifted between them (the big joke in Hoult's Jack was that he was afraid of heights, but he seemed to have gotten over his fear remarkably quickly and said fear wasn't really a big part of the story). One bit of wit in the screenplay is when Elmont is addressing his aide Crawe (Eddie Marsan). 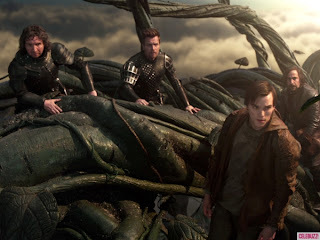 "I'm getting an awfully bad feeling about this, Crawe," Elmont tells him as they climb the beanstalk. Shadows of Obi-Wan? As a side note, it does seem odd that three men working in tandem (I figure) could not seem to agree on what kind of film they wanted Jack the Giant Slayer to be: a straightforward adventure story or more of a lark, a light picture. It was as if they couldn't decide to go for the Mirror Mirror school (make the fairy tale light and breezy) or the Snow White and the Huntsman route (dark and gritty), so they opted to do both. Just when you think things will get serious, we get bits of comedy (poor Elmont about to be made into a snack). Just when you think you're going to have some comedy (the King's camp has turned into a fairground with jugglers and magicians), we get intense action (the beanstalk is collapsing). I didn't find the shifts that bothersome but I did wonder whether if they had kept one tone throughout the film Jack and the Giant Slayer might have turned out better. In terms of performances Bryan Singer did a good job of getting what he wanted out of his actors if he wanted Tucci and McGregor to act as if they were in a comedy and an action picture respectively. Hoult was a good lead as the naïve country boy who is forced to become an action hero. He wasn't given a great deal to work with but he did as well as he could. McShane got the caring father aspect of his character. Of all the performers, I think only Tomlinson got the short end of the stick. We're suppose to believe she's a brave warrior princess-type but for most of Jack the Giant Slayer she was a damsel in distress, rarely if ever taking any action that would show she was indeed equal to the task of fighting. Somehow she got lost in the shuffle, and that is a real shame. In the end after I left the theater I can't say I walked away angry or disappointed with Jack the Giant Slayer. I didn't have particularly high expectations and said expectations were met. The most I can say about the film is that it was a 'could have been better but it's not horrible and soon forgettable films', one that you can use to slay an empty two hours with.